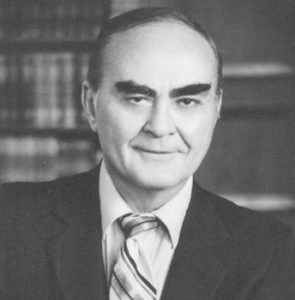 Edwin C. Kimmel, who passed away in 1984, built over 4,000 residential units in Northern California. He was one of the founding partners of Lewis Homes in Upland, one of California's largest home builders. A resident of Sacramento, he was President of the Northern California Division of Lewis Homes and President of Kimmel Enterprises, Inc. He attended both the University of Southern California and UCLA after his military service. He later taught courses at Southern California's El Camino College. Active on industry political action committees at the national, state and local levels, Mr. Kimmel was a Life Director of the National Association of Home Builders, Past President of the Riverside/San Bernardino Chapter and the Baldy View Chapter of the Building Industry Association of Southern California, as well as Past President of the Sacramento Chapter in Northern California. He was a Trustee for the Northern California Carpenters Trust Fund. Edwin was Past President of the Building Industry Association of Superior California and 1979 Builder of the Year. Mr. Kimmel was also a Director of the California Building Industry Association. Mr. Kimmel served on the Citizens Advisory Committee of Sacramento. He was always active in civic affairs. He served on various Chambers of Commerce and arranged for many donations. ​His efforts toward the advancement of the building industry were often behind the scenes and seldom for personal gain. Edwin C. Kimmel was dedicated to the building industry and his contributions will affect us for years to come.